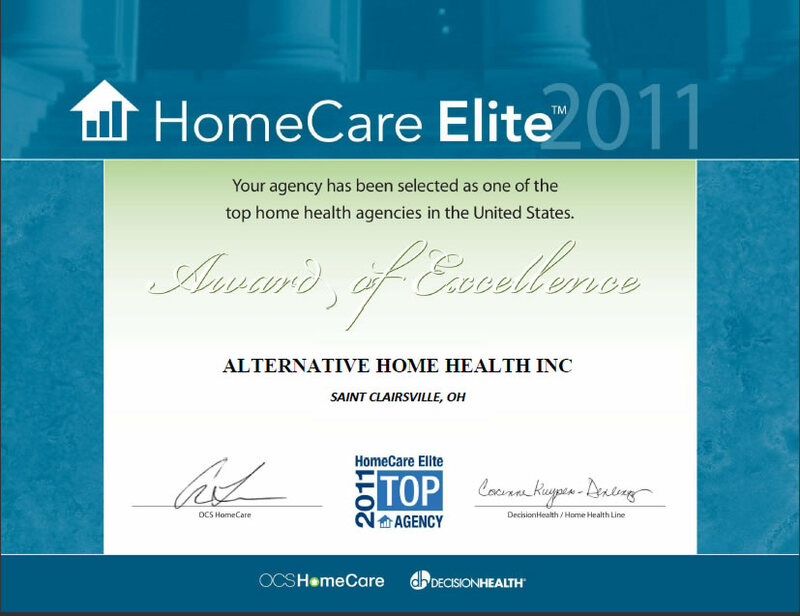 St. Clairsville, OH, 12/30/11 — Alternative Home Health today announced that it has been named to the 2011 HomeCare Elite™, a compilation of the top-performing home health agencies in the United States. Now in its sixth year, the HomeCare Elite identifies the top 25 percent of agencies and further highlights the top 100 and top 500 agencies overall. Winners are ranked by an analysis of performance measures in quality outcomes, process measure implementation, and financial performance. Alternative Home Health, Sheila Smith, President, credits patient-centered care and attention to detail with the company’s ability to rank as one of the HomeCare Elite. She said, "We continually strive for the best patient outcomes. Our uncompromising dedication to doing the right things for the right reasons, while keeping our focus on patient outcomes is the key to our success." “The HomeCare Elite designation continues to gain significance given the regulatory changes and challenges that agencies face. Agencies that have earned recognition among the HomeCare Elite demonstrated that they not only can adapt to an evolving marketplace but continue to excel in both clinical and financial outcomes,” said Marci Heydt, product manager for the post-acute care business group, DecisionHealth. About Alternative Home Health, Inc. Alternative Home Health is locally owned and operated by Sheila and Bruce Smith. It is the only independent or free-standing, Medicare certified home care agency (not affiliated with any hospital or national chain). 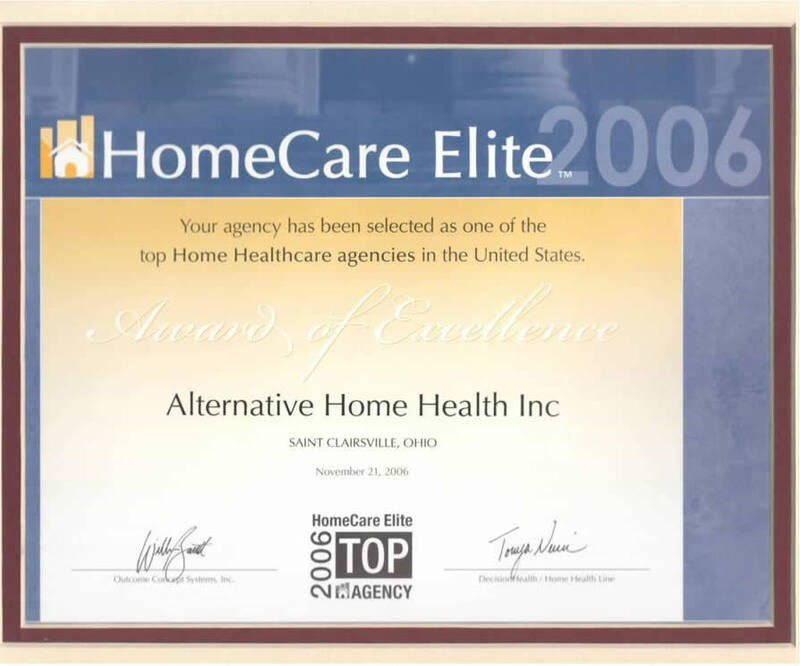 In 2008, Alternative Home Health purchased East Ohio HomeCare from Ohio Valley Medical Center (OVMC) and East Ohio Regional Hospital (EORH) to become the largest homecare agency in the Ohio Valley. The agency is located in the Giffin Park Church in St. Clairsville, Ohio. The agency provides skilled nursing, physical therapy, occupational therapy, speech pathology, medical social services, and aids to care for residents throughout the Ohio Valley. Sheila Smith has developed a mission that addresses a commitment to providing quality care. The management team boasts over 100 years of home care expertise. This expertise guides the overall agency operations to maintain the highest quality care. Our management and staff are responsible for having achieved and maintained excellent survey results. Our goal is to help our patients reach their highest level of health and be able to function independently without our service. For 25 years, DecisionHealth has served as the industry's leading source for news, coding tools and resources and training materials found in reputable products such as Home Health Line, Diagnosis Coding Pro for Home Health and the Complete Home Health ICD-9-CM Diagnosis Coding Manual. Our unique blend of award-winning staff journalists and unmatched access to health care executives and industry experts enables us to provide solutions, tools and guidance that are relied on by nearly 100,000 home health care and specialty physician practice professionals. For more information, please visit www.decisionhealth.com or call 877.602.3835.